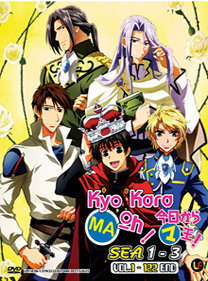 Kyo Kara Maoh!, known in Japan as Kyō Kara Maō! takes place in an alternate world that Yuri Shibuya travels to by coming in contact with water. There are many nations in the alternate world, however, the plot centers around the "Great Demon Kingdom". The people of the kingdom are Demons. The Demon Tribe have the ability to make a pact with an element, and they can use Majutsu which they can control with Maryoku. In the English translation, both terms are rendered as "magic". Covenant Castle (also translated as Blood Pledge Castle), is in the capital of the Great Demon Kingdom. It is the residence of the Demon King. The culture in the Great Demon Kingdom is very different from the Japanese culture Yuri is accustomed to, and the differences make for some amusing mishaps with long ranging consequences, such as an accidental proposal of marriage.